Over the weekend I headed down to CERN in Geneva to check out the Strobist seminar on February 21st, 2009. I went down on Friday to shoot Geneva graffiti and ended up doing coverage of a Tamil Tiger demonstration at the United Nations, but those stories wait for another day. I’m the sort of person who doesn’t like spending money on photography education, mainly because there’s nothing really complex or technical about taking pictures which seems to justify the cost of advertised offerings like the Luminous Landscape workshops. A camera is a lightbox, you add light with flashes or manipulate natural lighting, what’s there to learn? You take the vision in your head and make it a reality. But I do occasionally drop money here and there, a Joey L Photoshop DVD, a book on Skin, a book by Michael Grecco, and I figured it was time to join a lighting workshop. 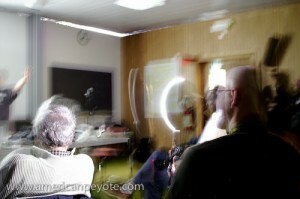 The Strobist workshop was all day on Saturday. We started around 9am, and finished at 5pm with a few breaks in between. In the morning we listened to David explain lighting design and methodology, and in the afternoon we watched David setup and execute four different lighting setups. When shooting a portrait outdoors, find a shaded location, under expose the ambient environment light, add light to paint the final picture using the strobes. Use the same basics for interior portraits. That’s it, like I said, photography isn’t exactly complex, so there’s no reason to take away confusing tidbits on lighting ratios. If you write up a business plan and ask for $500,000 from an Investment Angel for your startup, they will want to hear your idea described in 2-3 sentences (Swiss StartUp Camp 2009). That’s it, keep it simple. I see no reason why lighting design should be any different. Aside from having the basic process of lighting design, the afternoon exposed us to how to “execute.” Using the seminar room, we talked about four different locations to use for portraits. 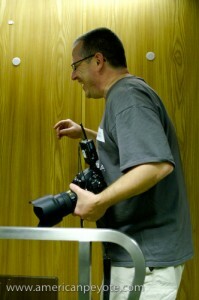 Then David set about the room with umbrellas and his Orbis ringflash, photographing participants. From a certain perspective, David Hobby is like the kid who got all the toys he wanted for Christmas, and spends every day rediscovering their amazingness. This was the impression I had watching him setup the different portraits. It seemed like each light setup was like finding a rocket in the backyard and getting to set it off. This is the corner stone, getting a sense for the energy and problem solving method of the man at work – the message which I took away from the afternoon. 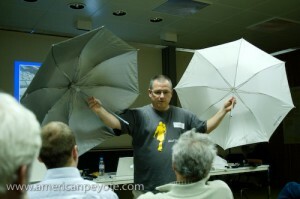 This aspect which is more difficult to communicate on a website like Strobist, and a good reason to attend a workshop. The technical aspects are of course – trivial. Flashes are not complex, neither is lighting design, it’s how one executes the shoot which matters. When photographing, be a kid at play and you’ll have fun and take away cool photos. That’s it, nothing too complex. Yeahhhh, Baby. That’s what we heard every five minutes, David’s way of pulling an emotional response from his subjects. It made me think of Platon asking Bill Clinton to “Show me the Love.” By channeling Austin Powers, David pulled a smile from everyone in the room, every time he said the same line again, and again and again, it got a positive reaction. Apparently he has other lines, but since “Yeahhhhh Baby” worked every time, there wasn’t any need to bring out the reserves. Basically much of the technical information I took away from the Strobist seminar is covered on Lighting 101 and 102 on the Strobist website. Of course, pretty much all knowledge is available on the internet, you can teach yourself JAVA programming, electrical engineering, and quantum physics if you’re disciplined. The question I always ask in my head, “was this really worth it?” Yes, in the end I left CERN happy that I’d dropped 150 CHF on a Strobist lighting seminar, plus travel between Zurich and Geneva and a sound-proof hotel room on Friday night, just as I’m still happy I dropped some 200 odd dollars on the Joey L Photoshop DVD. And that’s the key to having a successful StartUp, give people something which they feel they need, and which they find value in, and you’ll be successful. If you’re in Switzerland an interested in Strobist stuff, check out Swiss-Strobist. There’s a post about the CERN workshop and info on the 1st Swiss-Strobist meetup for 2009.